Ms. Munoz is a 70-year-old female who arrived to The Hamlet Rehabilitation and Healthcare Center at Nesconset on November 16th after her stay at Mather Hospital for a left humerus fracture and pelvic fracture. Ms. Munoz came to New York from California to attend her granddaughter’s wedding. Unfortunately, she fell down the stairs the night before and never made it to the wedding. Within the first 25 minutes of her entering our community, she was seen by valued members of the team who welcomed her within the first 12 hours. Ms. Munoz was evaluated by our occupational and physical therapy teams upon admission as well in efforts of creating a personalized, comprehensive care plan. Ms. Munoz’ main goals for discharge was to safely perform functional transfers, achieve and maintain balance, and to ambulate on level surfaces 150 feet using the Hemi walker with set-up assistance. During her physical therapy sessions, Ms. Munoz worked on activities and exercises centering on ambulation, transfers, and balance to increase mobility and functionality, while decreasing required assistance. Through the use of therapeutic resistance exercises, progressive resistance exercises, quad sets and ankle pumps, Ms. Munoz was able to perform safety sequencing techniques, proper body mechanics, position maneuvers, safety precautions and energy conservation techniques in order to facilitate improved functional abilities. During her occupational therapy sessions, Ms. Munoz worked on completing commode transfers, safely performing toilet tasks, efficiently performing upper body dressing, and performing hygiene and self feeding tasks. After achieving continued progress and nearing her much anticipated discharge date home, not only was Ms. Munoz able to meet her goal of safely ambulating 150 feet on level surfaces but was able to exceed expectations and ambulate 200 feet on level surfaces with the least restrictive assistive device. 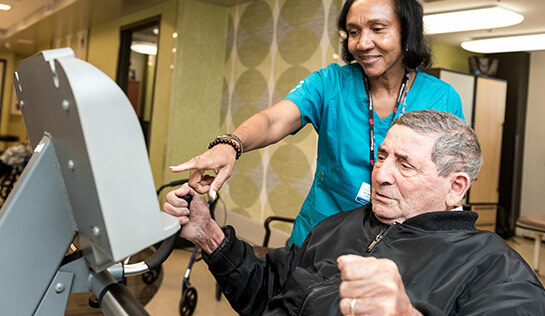 Through the teamwork and cooperation given by physical and occupational therapy and the entire nursing team, Ms. Munoz was able to enjoy a successful and pleasant stay at The Hamlet Rehabilitation and Healthcare Center at Nesconset. We wish Ms. Munoz a safe, healthy discharge to her daughter’s home and hope she can return to her own home in California in the very near future.